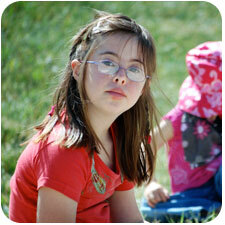 Children with Down syndrome are at a much higher risk for congenital heart disease. As a comparison: the incidence of congenital heart disease in the general population is 0.8 percent. 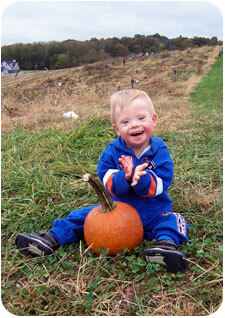 The incidence of congenital heart disease in children with Down syndrome is between 40-60 percent. Some heart defects can be left alone with careful monitoring while others require surgery to correct the problem. The following types of heart defects in children with Down syndrome are discussed below. Atrioventricular Septal Defects (AVSDs) – These are the most common in children with Down syndrome. These heart defects are defined b a hole in the wall between the top chambers (atria) and bottom chambers (ventricles) and one common valve between the two areas. In some cases, there might not be a hole between the bottom chambers. Or the valves may not be joined together, but either or both might leak. This is known as valve incompetence. Because of the high pressure in the left ventricle which is needed to pump the blood around the body, blood is forced through the holes in the central heart wall (septum) when the ventricle contracts. This increases the pressure in the right ventricle. This increased pressure (pulmonary hypertension) results in excess blood flow to the lungs. Some of the early symptoms seen are difficulty in eating, weight gain, fast irregular breathing and a degree of cyanosis (blueness) particularly noticeable around the mouth, fingers and toes. Clinical examination may show an enlarged heart and liver, and a diagnosis of ‘heart failure' may be given. This term is used because of the flow of blood from one side to the other; the heart has to work harder than normal causing the heart to fail to work normally. Not all children will exhibit symptoms early in life, and those that do will not always show all of these. Early treatment may involve the use of diuretics to control the fluid retention around the body and to reduce the volume of blood in the circulation, thus making the heart's workload easier. These may be used in conjunction with other drugs that increase the contraction of the heart muscle. Slow weight gain may indicate the need to use high-calorie formula increase calorie intake. Severe eating problems may warrant using a naso-gastric tube (through the nose and directly into the stomach) to help with proper nutrition. The majority of cases of AVSD usually require surgical intervention; this generally takes place within the first six months of life. In this defect there is a hole between the bottom chambers (pumping chambers or ventricles). Because of the higher pressure in the left side of the heart, this allows oxygenated blood to flow through the hole from the left to the right side of the heart, and back to the lungs, in addition to the normal flow. The amount of blood flow from the left to right ventricle depends on the size of the hole and on the pressure between the ventricles. In other words, the higher the rate of flow means more strain on the heart. The abnormal blood flow is responsible for the murmur that may be heard. Generally patients with a small VSD will not exhibit symptoms (they are asymptomatic) and the problem may only be found when a murmur is detected upon routine examination. Patients with a moderate VSD may breathe quickly, exhibit poor weight gain, and be slower at eating. These children are also much more prone to chest infections. This tends to be more pronounced when the hole is large. As with ASVDs, patients with moderate or large holes usually require treatment with diuretics to control fluid retention and to reduce the volume of blood in the circulation may be used. Also, high-calorie formula or tube feedings might be necessary. Many VSDs will close spontaneously or get much smaller, so it is normal practice to leave a child with a small or moderate VSD and monitor their progress before deciding to operate. Surgery may be needed if there is failure to thrive despite medication, or concern about pulmonary hypertension. If a large VSD is present, surgery is almost always recommended. In this defect there is a hole between the top chambers (receiving chambers or atria). Because of the higher pressure in the left side of the heart, oxygenated blood flows through the hole from the left to the right side of the heart, and back to the lungs, in addition to the normal flow. There are three types of Atrial Septal Defect; the most common is when there is a hole in the middle of the central heart wall. Holes in the lower part of the septum, called the primum defect (partial atrioventricular septal defect), are often associated with a problem of the mitral valve that often results in a leak. Less common are sinus venosus defects or holes in the top of the septum. These are associated with an abnormality of the right upper lung vein. Generally patients with an ASD defect will exhibit no symptoms and the problem is only found when a routine clinical examination detects a heart murmur. Occasionally children with this problem will exhibit poor weight gain and a failure to thrive, and if there is mitral valve leakage there may be early symptoms of breathlessness. Small holes which allow little blood flow from left to right generally cause no problems. If they are located in the middle portion of the central heart wall, they may even close on their own. However, moderate and large holes do not close, and the extra work over the years places a strain on the right side of the heart causing an enlargement of both pumping chambers. Therefore, treatment (surgery) is usually recommended in the first few years of life for larger holes, before excessive strain has been placed on the heart. This defect is the continuance of a direct connection between the aorta and the lung (pulmonary) artery, which normally closes shortly after birth. A baby in the womb is supplied oxygen by the placenta via the umbilical cord. The baby's lungs are not expanded and require only a small amount of blood for them to grow. The ductus is a blood vessel that allows blood to bypass the baby's lungs. Generally the ductus close within a few days of birth, and the connections between the two sides of the heart no longer exist. The resistance to blood flow quickly falls with the onset of breathing. In some babies with Down syndrome the ductus fails to close. This causes higher pressure in the left side of the heart and increases the amount of blood flowing into the lungs. If the ductus has partially closed and only a narrow connection remains, the baby won’t show symptoms. If the connection is larger, the baby may be breathless and tired and show poor weight gain. If the ductus remains open for more than three months, it is unlikely to close on its own and surgical closure is recommended. A small percentage of babies with Down syndrome have this complex heart condition which combines the most common defect associated with Down syndrome, AVSD, with Tetralogy of Fallot. The combination of these defects early in life almost seems to balance out such that the child may be rather blue, but not too breathless. There can, of course, be too much blueness or too much breathlessness, depending on the severity of the different conditions. The type of surgery depends on the severity of the AVSD or the Fallots. Usually, the children are quite blue and require a BT shunt to increase the amount of blue going to the lungs. Then another operation is performed later – usually at 1-2 years of age – so that the holes can be closed, the valves repaired, and the way out to the lung artery widened. In addition to the heart defects associated with Down syndrome, high blood pressure in the lungs (pulmonary hypertension) is more common in people with Down syndrome. This high blood pressure may be a result of malformation of the lung tissue, but the exact cause is not known. Higher blood pressure may limit the amount of blood flow to the lungs and therefore decrease the likelihood of symptoms of congestive heart failure seen in babies with complete AV canals or large ventricular septal defects. This then causes the problem of delaying a possible needed surgery to close holes in the heart. These babies must be watched carefully in order to determine the best time for surgery. The majority of cardiologists agree that all babies diagnosed with Down syndrome should have a cardiology evaluation. This is because of the high incidence of associated congenital heart defects. A good history and physical examination should be performed by an experienced cardiologist to rule out any obvious heart defect. An electrocardiogram should be performed. This can be very helpful in making the diagnosis of AV canal, even when physical symptoms are absent. Some doctors also choose to perform at least one echocardiogram to rule out other subtle heart problems. If the diagnosis of congenital heart disease is made, the cardiologist normally follows up with the child through routine office visits. Most patients can be watched clinically to determine if the child is having difficulty because of the heart defect. Occasionally, a repeat electrocardiogram, chest X-ray, or echocardiogram is performed to further evaluate clinical changes. These tests are likely to be repeated before surgical repair is recommended. Rarely, a cardiac catheterization is required for complete evaluation prior to corrective surgery, especially in children where elevated pressures in the lungs are a concern. Parents of a child with Down syndrome need to work closely with their child’s doctor(s) to determine what route (surgical or medical) will best serve their child. Freeman SB, Taft LF, Dooley KJ, Allran K, Sherman SL, Hassold TJ, Khoury MJ, Saker DM (1998), Population-based study of congenital heart defects in Down syndrome.